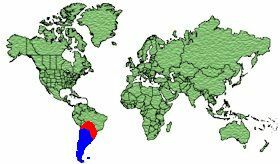 Argentina, Chile and Falkland Islands. 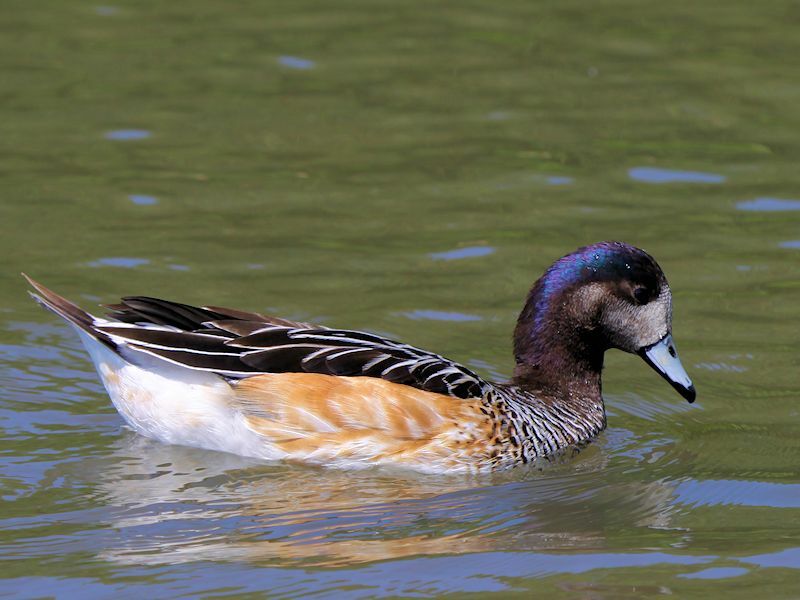 Winters in Uruguay, Paraquay and South Brazil. 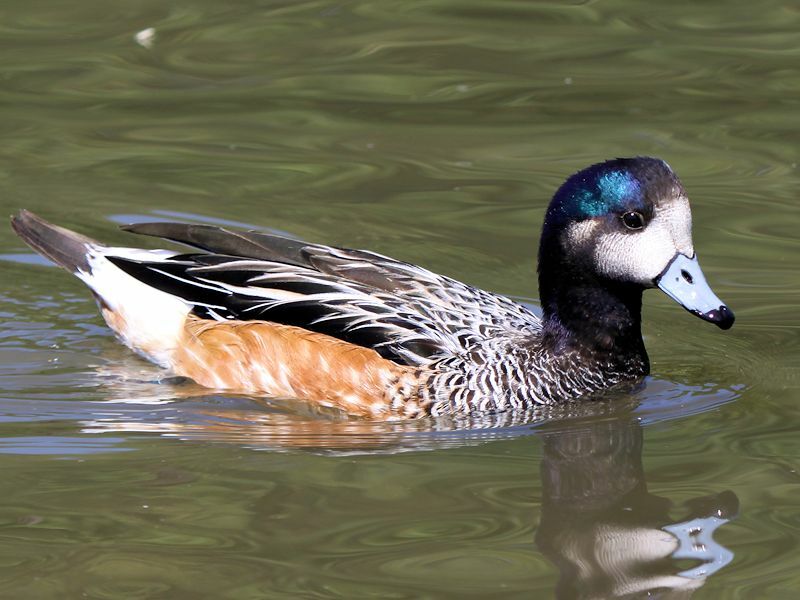 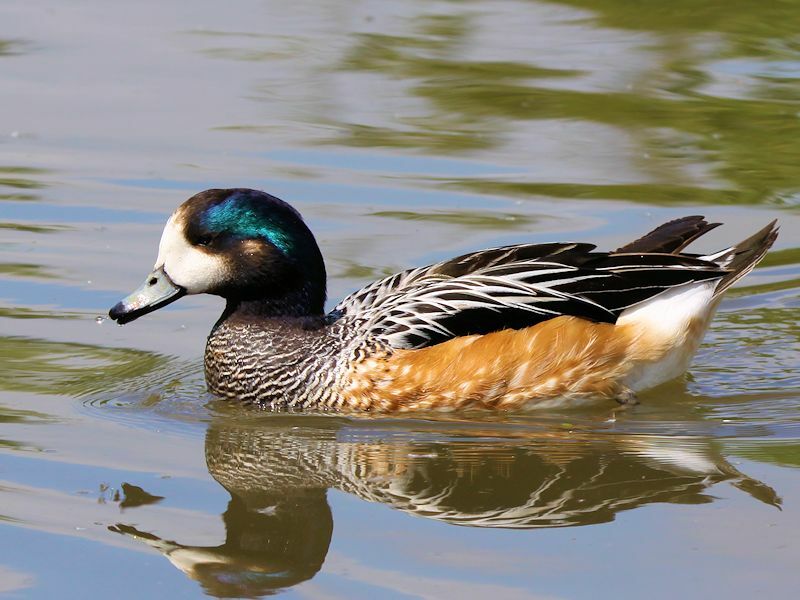 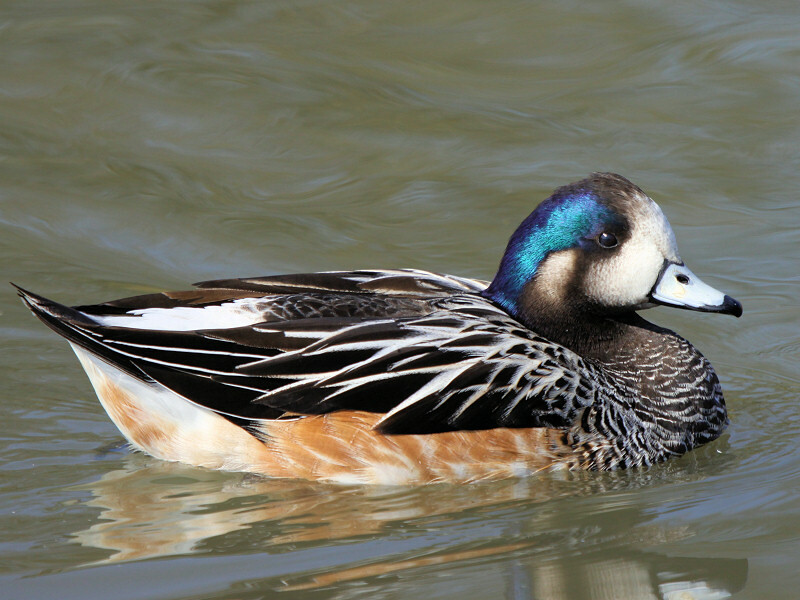 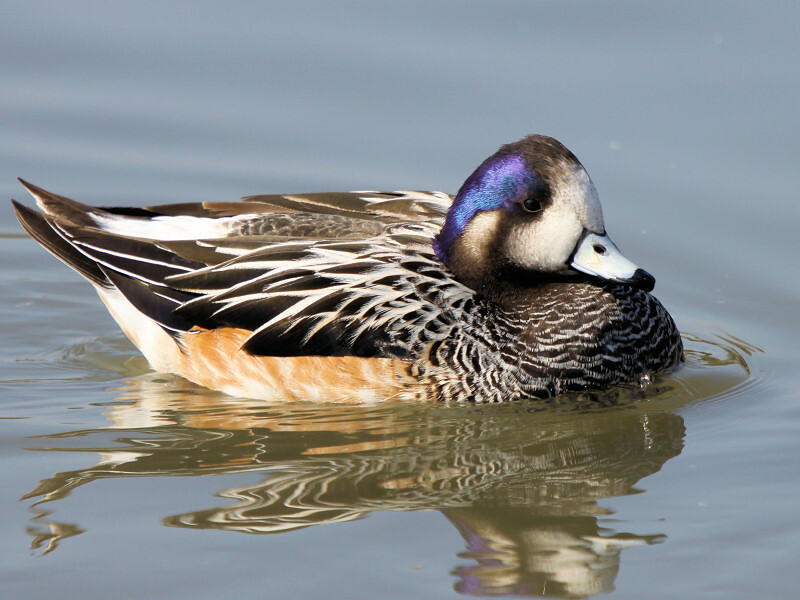 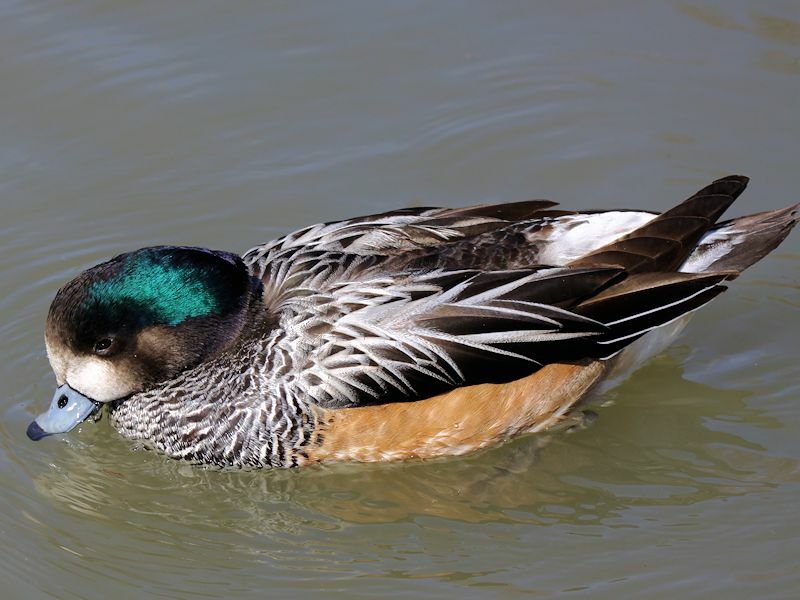 The male has a Green Blue iridescent cap on its head, a Blue Grey bill with a Black tip, Cheeks and forehead are White, Dark Brown eyes and a White auricular patch. 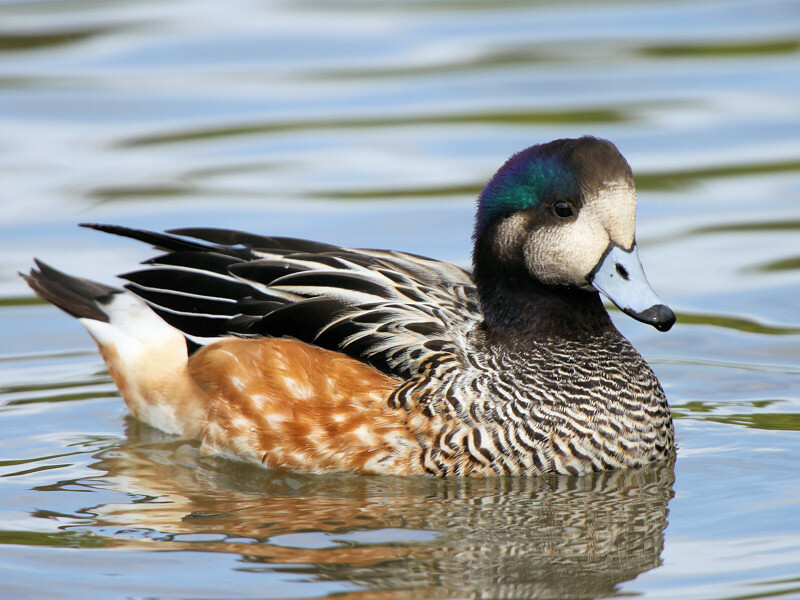 The neck and back of the head are Black, the breast is mottled Black and White, the wings are Grey and White. 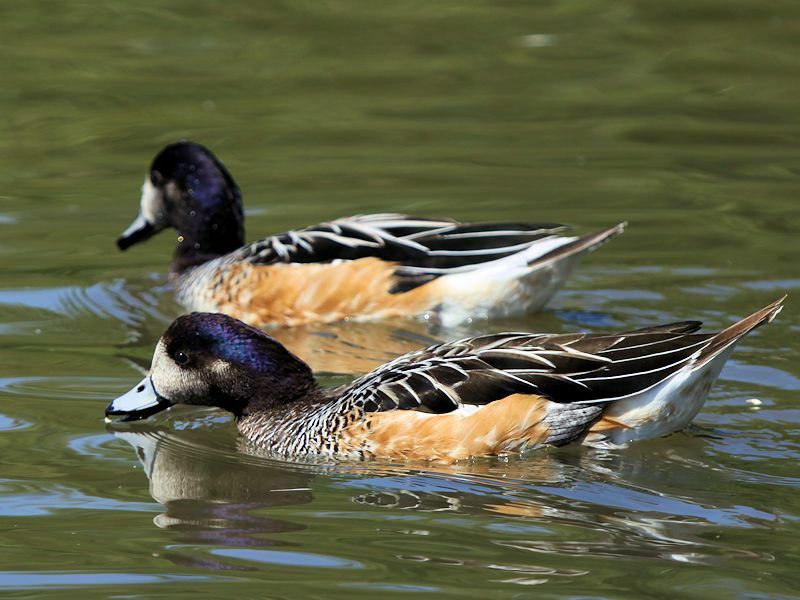 The flanks are Orange Brown,with a Black tail and Dark Grey legs and feet. 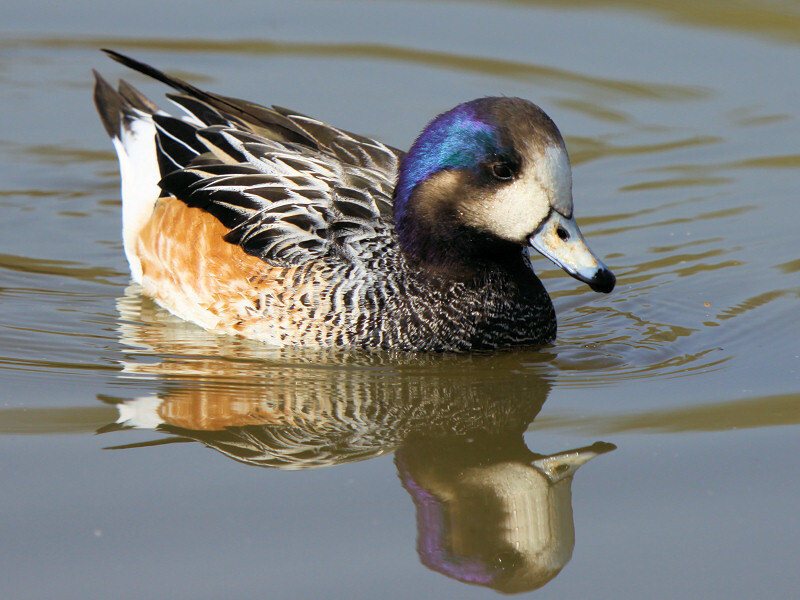 Similar to the male but slightly duller and smaller. 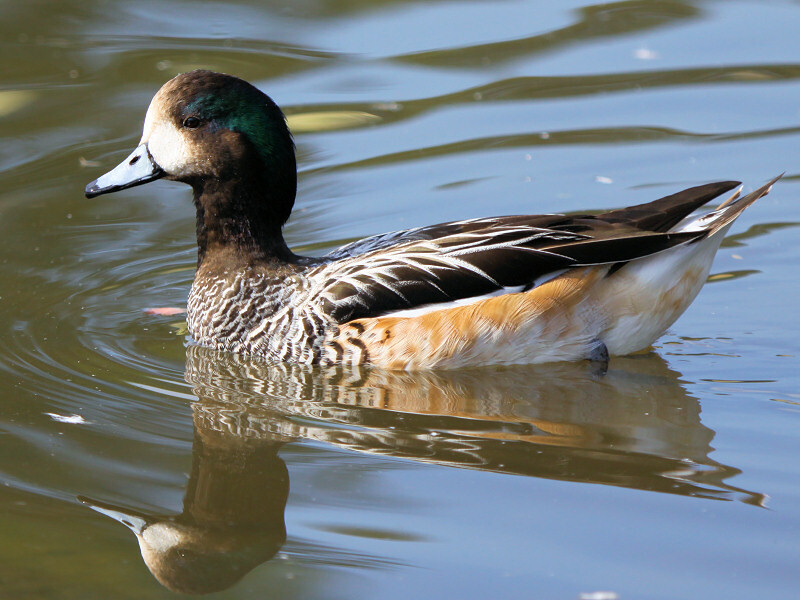 Freshwater Lakes, Marshes, Shallow Lagoons and slow flowing Rivers. 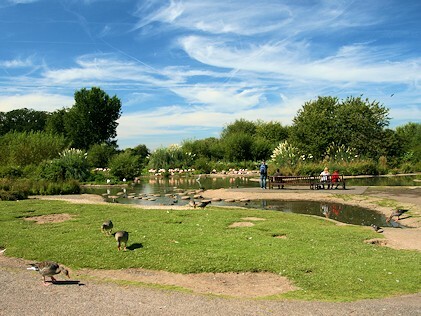 Aquatic Plants, Grass and occasional Algae. 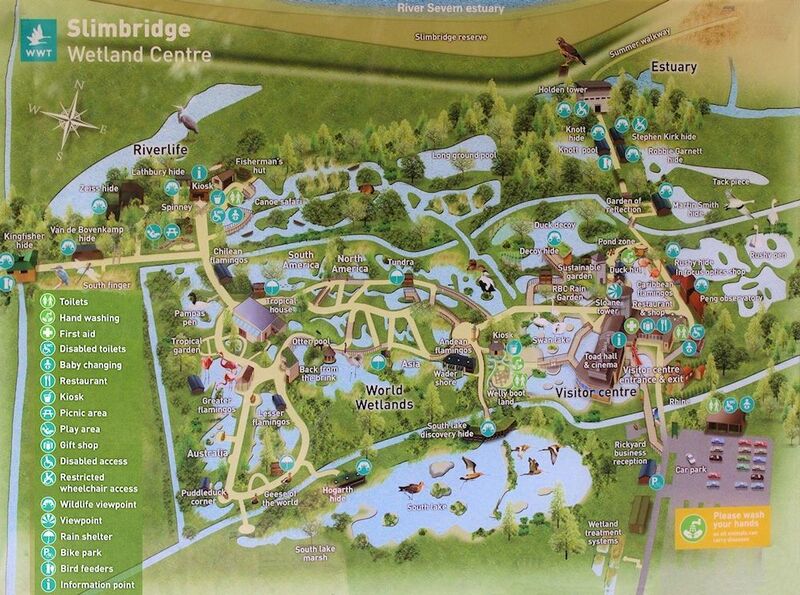 The nest is built in Grasses and under Bushes. 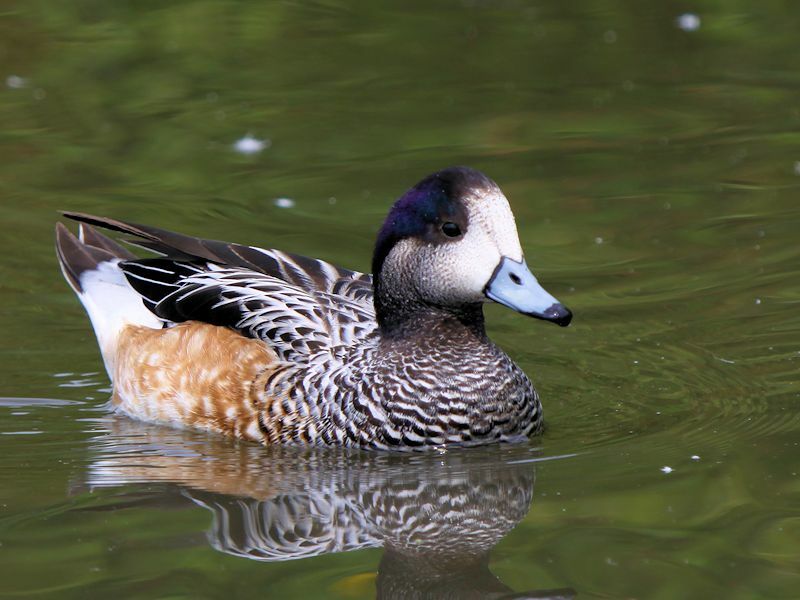 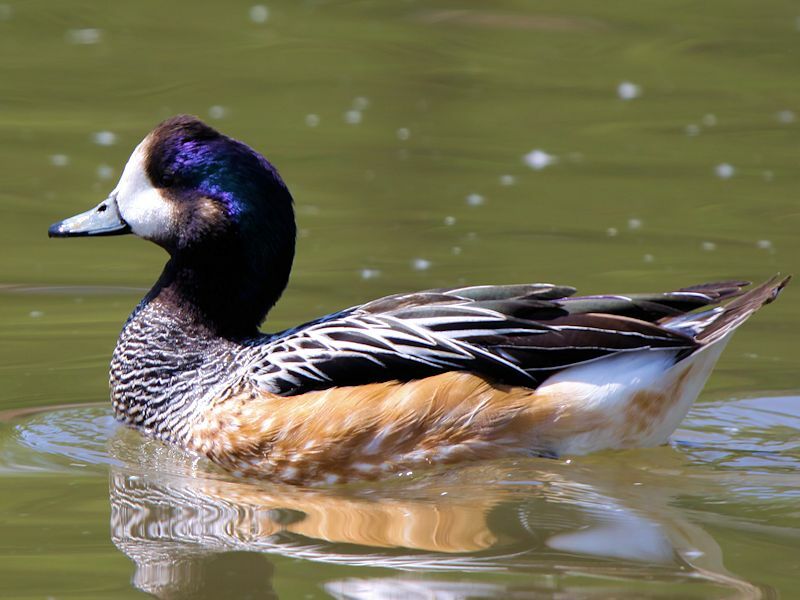 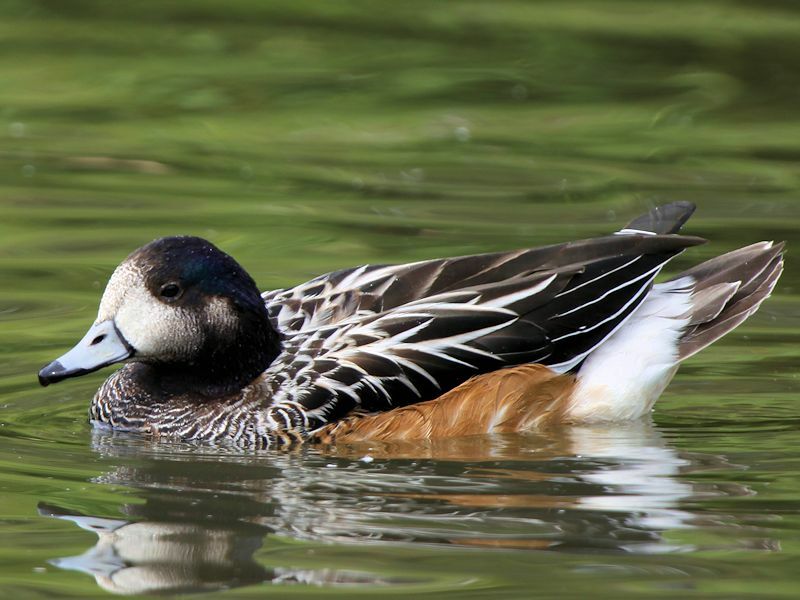 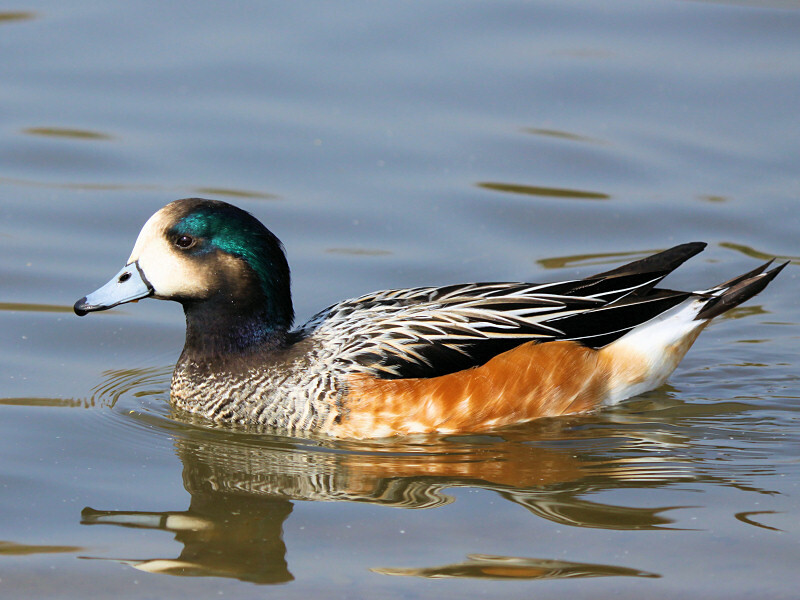 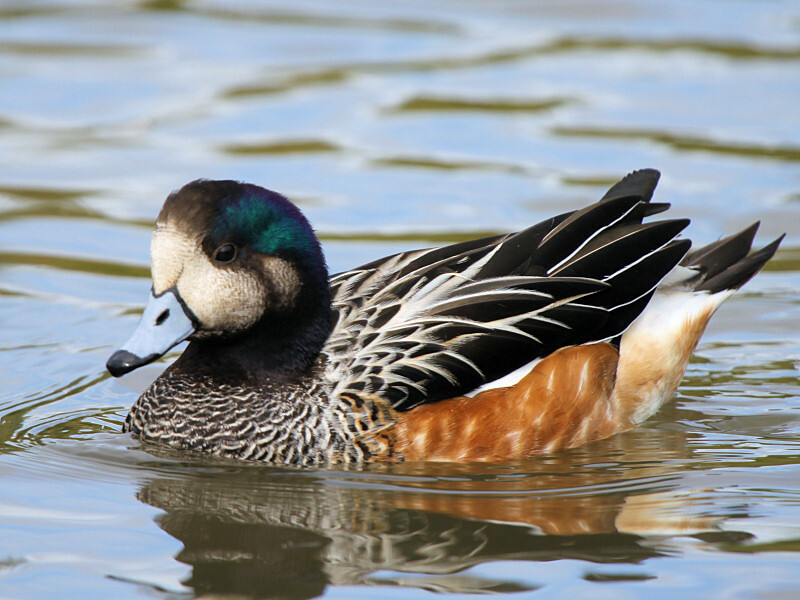 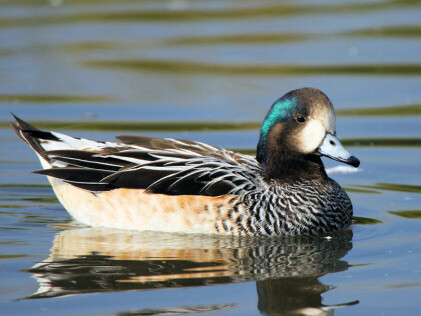 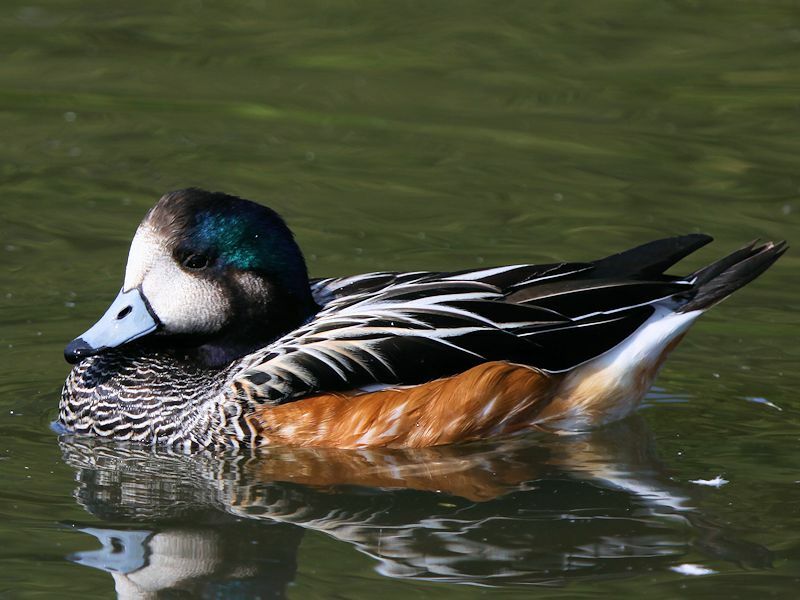 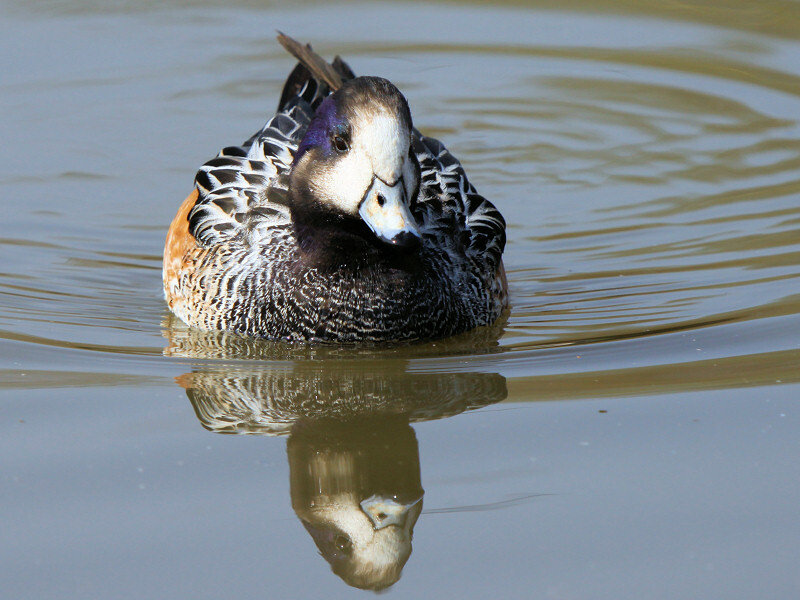 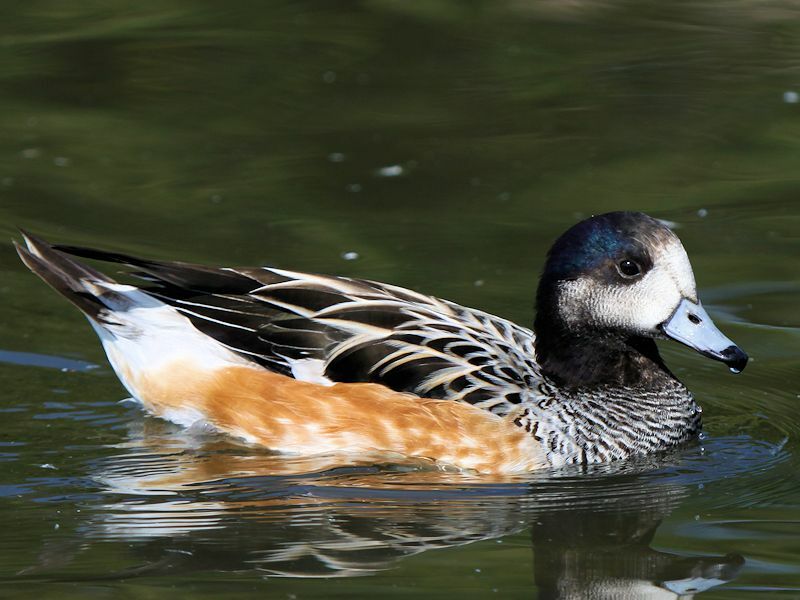 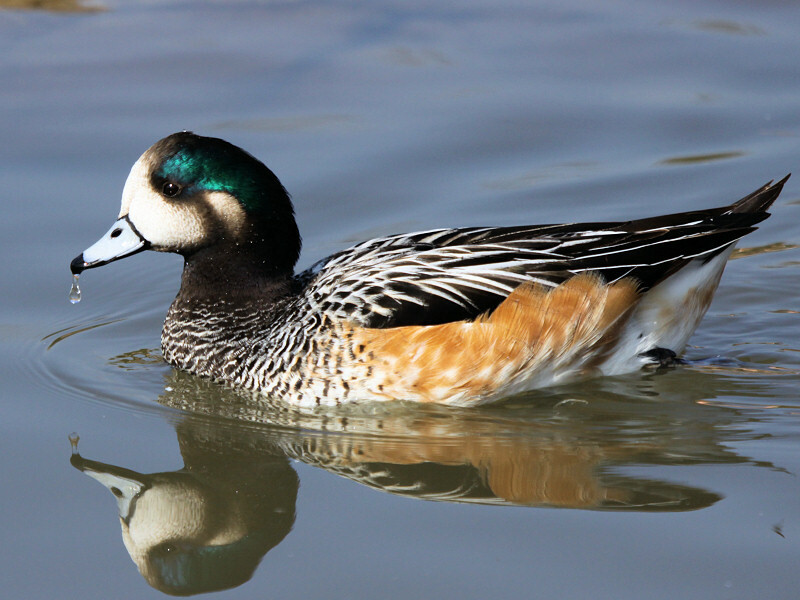 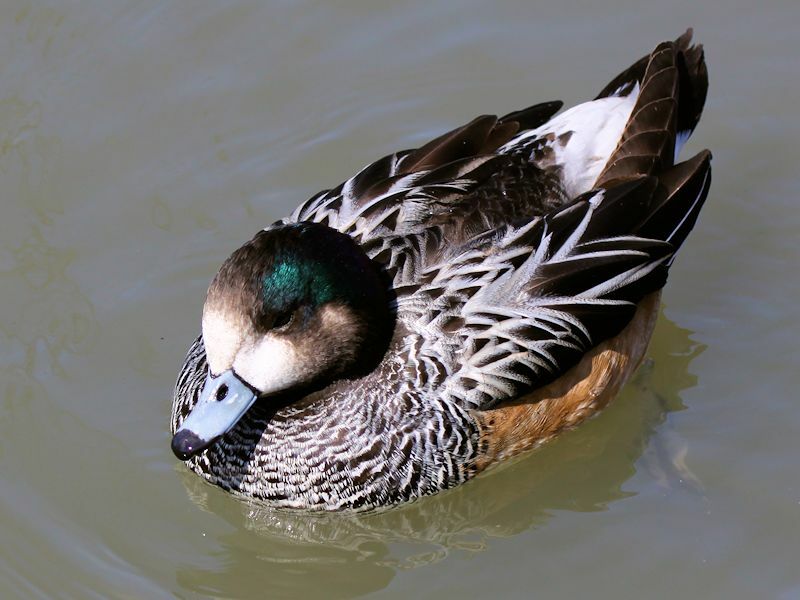 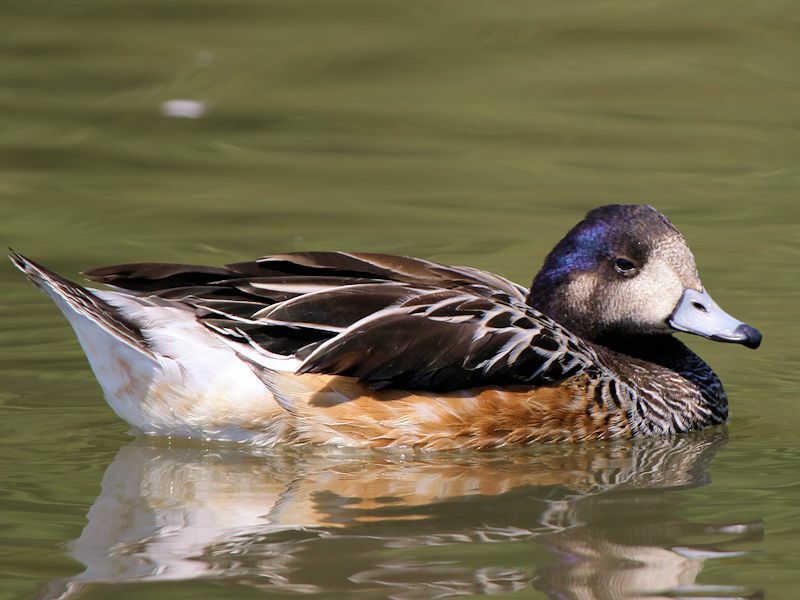 The Chiloe Wigeon, also known as the Southern Wigeon, is a dabbling duck of South America. 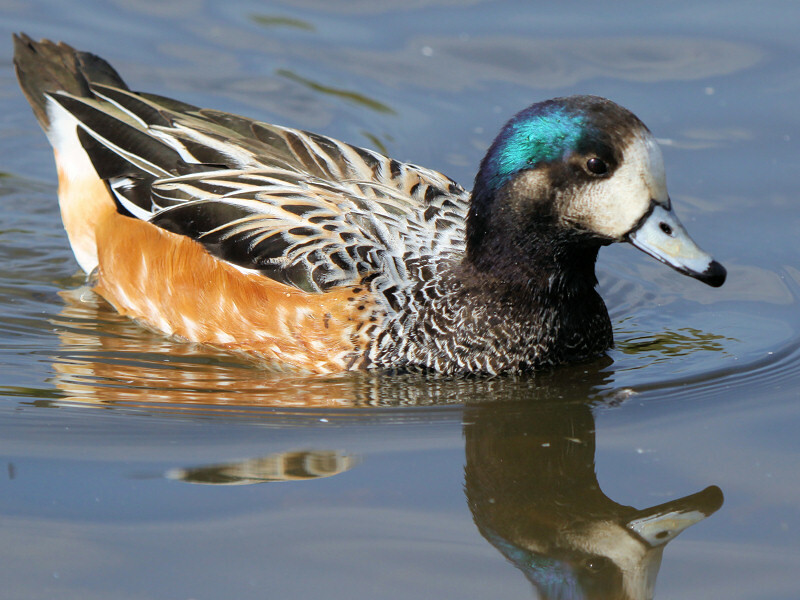 Being a very sociable bird the Chiloe Wigeon tends to mate with different types of bird creating hybrids. 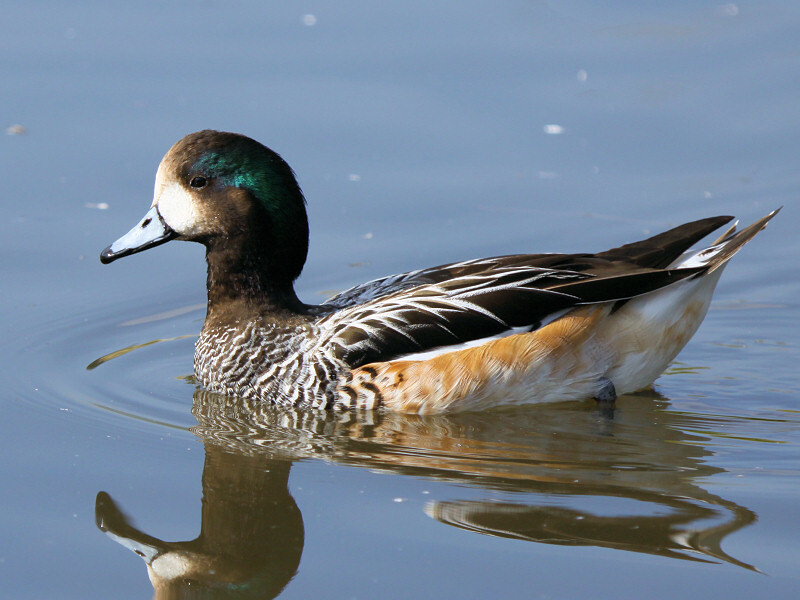 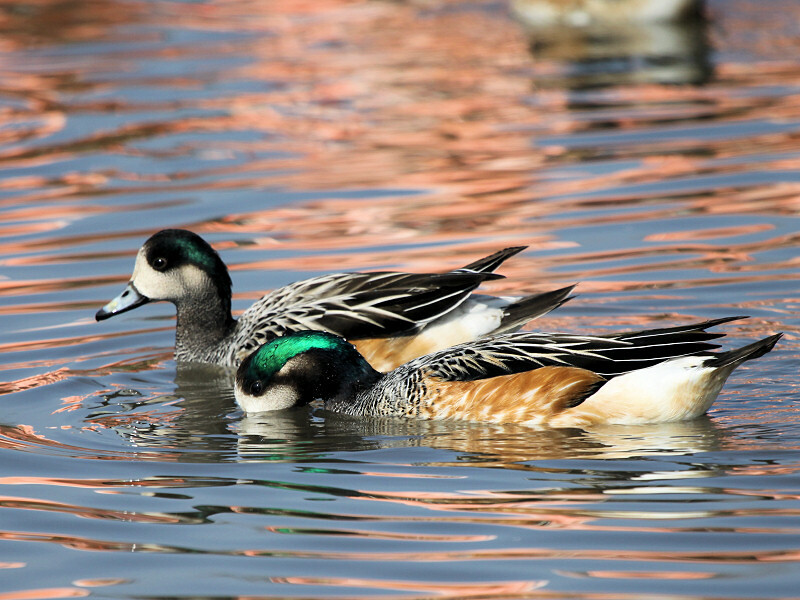 The population of the Chiloe Wigeon is stable and they are classed as Least Concern.